Today is Rachel's first day of classes as a college student. 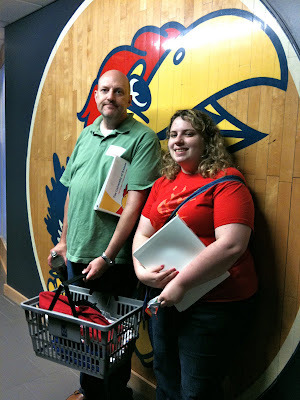 During orientation we made a shopping stop at the bookstore for the all-important KU gear. Last Sunday we got her moved and settled into the dorm and she met Korinne, her roomate. Her cute Dad hauled the REALLY heavy stuff. The bed seems to be comfortable enough. Her cello seems happy there, and there's lots of wall space/bulletin board space for decorating. Pictures of friends and family were strung over the bed. It was hard to say good-bye to the boyfriend.